Do you know the secret to making savory soups, heavenly beverages, or any flavor-rich dressing? Perhaps, most of you are thinking that delicious food is all about adding all the right ingredients precisely. To some extent, that is true. However, it is not the only reason behind a good recipe. It’s all about perfect blending with the help of quality blenders. A high-end blender not only combines the contents, but it also enhances their flavors, keeping the quality maintained. In today’s market though, getting a good-quality blender at an affordable price can be a difficult task. While doing so, you will find plenty of options in the market that may confuse you. Therefore, to help you find the right product, we have reviewed one of the best blenders for you, the SmartStick CSB-76BC Immersion Blender by Cuisinart. To fulfill its motto, which goes “Savor the Good Life”, Cuisinart has been serving premium-quality products globally since 1989. Managed by the Conair Corporation, this U.S.-based brand continues to strive to revolutionize the culinary art. With the wide array of kitchen appliances that they offer, this brand is an all-time favorite of chefs and consumers across the globe. 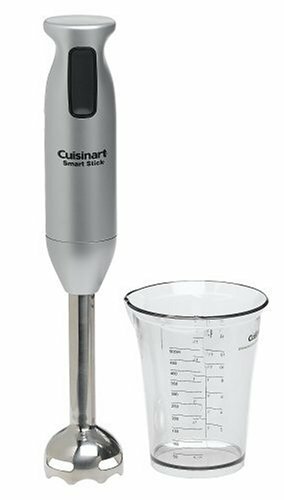 Similarly, the Cuisinart CSB-76BC SmartStick is one of its latest innovations, which promises a smooth and easy blending for flavorful recipes. The package includes an immersion hand blender integrating a powerful motor. This motor operates at 200 watts, which means it is energy efficient. Other than these two, every purchase also contains a plastic beaker or measuring cup that can carry up to 16 ounces. The beaker is made up of BPA-free plastic, which means that it doesn’t contain Bisphenol-A, a carcinogenic compound. While you will see a plastic enveloping the upper part of the motor, the rest of its parts are made up of metal. The blending shaft is made up of stainless steel. Be it a pot, bowl, pitcher, or a plastic beaker, you can immerse this long-necked blender in any kind of vessel. Featuring an ergonomic grip, this device offers a firm yet comfortable hold while blending. With its firm and robust grip, you can easily control the blender. To make the design and operation simpler, the machine is equipped with a single push button. As a matter of fact, it’s simple design makes blending easier. What’s more is that due to its smoothly blending blade, you will hardly find any liquid splattering out of the beaker. Thus, the product keeps your workplace clean and tidy. Apart from brushed chrome, this device is also available in raspberry, light blue, metallic red, pink, red, and white colors. With this range of available stylish colors, it can easily add elegance to your kitchen. With its detachable shaft and motor, the product is easy to clean. You won’t have to struggle a lot while washing the machine; simply pull off the shaft from the motor and wash it. The stainless steel shaft and plastic beaker are dishwasher safe too. Hence, you won’t have to think twice while blending anything because you just toss it in the washer effortlessly and have it clean again in no time. Moreover, because it is made up of microwave-safe material, the plastic beaker can be placed in the microwave without causing any trouble. This makes it very durable and versatile. Weighing only 2.5 pounds and measuring 3 x 3 x 14.45 inches, it is clear to see that this product is very handy and portable. To enhance the flavor of your cuisines, getting a good quality blender is crucial. It not only mixes the ingredients well but also makes your job easier and quicker. For this, we suggest you check out SmartStick by Cuisinart. No matter if you are pureeing a soup, blending a drink, or mixing pancake batter, the SmartStick blends everything efficiently and smoothly. With its simple design and easy features, the machine provides all you need for a good blending. To choose your blender wisely, you might consider other options available in the market. In fact, you may even find something at a lower price. While keeping all the other features in mind, we have compared the Cuisinart SmartStick with another good option, the KitchenAid Hand Blender. To start with the designs, SmartStick is simple as it features the one-push button that makes it easy to operate. In contrast, the Hand Blender by KitchenAid comes with more than one accessory, such as an immersion blender and a whisk. Though the product is praised for its multitasking capabilities, most of the consumers don’t like the integration as it makes things more complex than it should be. Secondly, the SmartStick by Cuisinart is available in seven fascinating colors. On the other hand, you will be short of color options when it comes to the KitchenAid Hand Blender. Available in contour silver, liquid graphite, and onyx black, the KitchenAid Hand Blender looks almost the same in any of these colors. Moreover, the SmartStick is also completely portable due to its lightweight and easy features. You can easily take it anywhere you want. Meanwhile, the KitchenAid Home Blender is difficult to carry around as it features a number of accessories. Lastly, when it comes to user reviews and consumption, the SmartStick is easily every chef and cooking experts’ favorite. In terms of brand recognition, Cuisinart is again a clear winner. To conclude, the SmartStick by Cuisinart is the right tool for blending and bringing out the ingredients’ flavors. If you want to show off your cooking skills to your friends and family, we recommend that you take advantage of the wonders that the Cuisinart SmartStick CSB-76BC offers. This product is ideal for making smooth and well-mixed dressings as well as beverages. Not only this, but it can also blend anything you want to add in your recipe. Overall, it is an ideal tool for preparing dishes professionally, quickly, and easily. Due to this fact, this device can easily be your next best kitchen partner.